Delays are inevitable when hardware just isn't enough to match real life Gainax physics. About two weeks ago, as I was getting a lift home from my friend's BF, I've notice he had an awesome silver colored air freshener. Why is it awesome? Because it's the head of RX78-2. Of course, I compliment that it's pretty awesome to have a Gundam head as an air freshener. My friend, was surprise I could tell, she thought it was Optimus Prime. 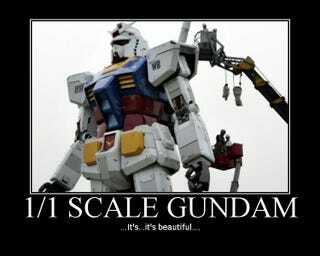 Anywho, according to my friend, I'm the first one to instantly recognize it's Gundam! and not Optimus Prime. A proud moment for me and a badge of dorkiness I wear proudly (not the first time I get super dorky in front of large group of friends). So what is your moment of proud dorkiness? Feel free to talk about whatever you like.